José Luís Peixoto reads from his first text Morreste-me (You Died on Me) along with translator and Warwick MA student, Phil Jourdan. 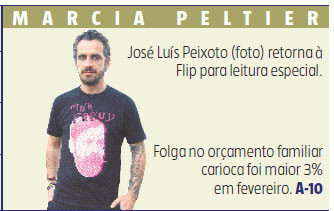 Peixoto reads the first two paragraphs in the original Portuguese. Jourdan reads the whole first chapter in English translation. 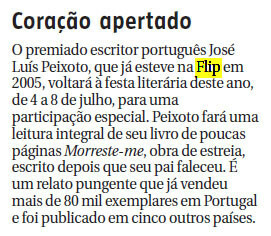 José Luís Peixoto is interviewed by Warwick MA student, Phil Jourdan, who has translated Peixoto's first text Morreste-me (You Died on Me) into English. A written translation by Jourdan was published in English for the Warwick Review, a literary journal published in the UK. Tese defendida na Universidade de Utrecht sobre questões da tradução de "Morreste-me"
Clicar aqui para fazer download da tese de Taras F. P. van Dijk. Análise muito completa de Morreste-me.